by Billy Sheahan (most often known as Old Billy at Sullivan’s pub), from Sheila Connolly’s County Cork Mysteries, who is delighted to kick off Killer Characters’ holiday celebration and giveaway! It’s been a good bit of time since we’ve met, and I’m proud to say I’m still here. Here bein’ Sullivan’s, the pub that old Mick Sullivan left to that nice young girl Maura Donovan when he passed. Maura’s been here since the spring and she’s makin’ a go of the place. It wasn’t easy fer her at first, but she’s quick to learn, young though she might be. Well, young to me, since I passed eighty some years ago. But Maura’s a hard worker and she’s settled in well, I’m thinkin’. It was a good summer fer the old place, but now I can see Maura’s worried about the slow winter that’s comin’. She’s kept most of the regulars who stop by fer a pint most days, but she’s not sure that’ll cover the bills. Then this young fella stops by, name of Timothy Reilly. Says he’s a student up at Dublin, and he wants to know about the music. Long before Maura’s time, that was, but she’s sent the lad at me, and I’m happy to tell him the stories, so long as he buys me a pint now and then. To look at the place now, it’s hard to recall that once musicians gathered here. Not just local players, but from all over. Names you might even know. I think they stopped in because mebbe they were tired of being stars and just wanted to get back to the music—to playin’ with their pals, which is where it all began fer them. Good times we had, when Mick was runnin’ the place. You never knew who might be walkin’ in the door from one night to the next. And somehow the word got out, that this band or the other would be playin’ here that night. Old Mick couldn’t afford—or couldn’t be bothered, more like—to put ads in the paper or on the radio. Nor did he need to, fer the people came anyways, as many as the place could hold. It’s hard to tell these young lads—mostly lads, they are, although a girl now and then—how it all was, back then. There’s only one way to put it: it was magic. The more I talk to young Tim, the more I think he feels that magic, and I’m hopin’ he’ll find a way to get Maura to try to bring it back. Wouldn’t that be a grand thing? 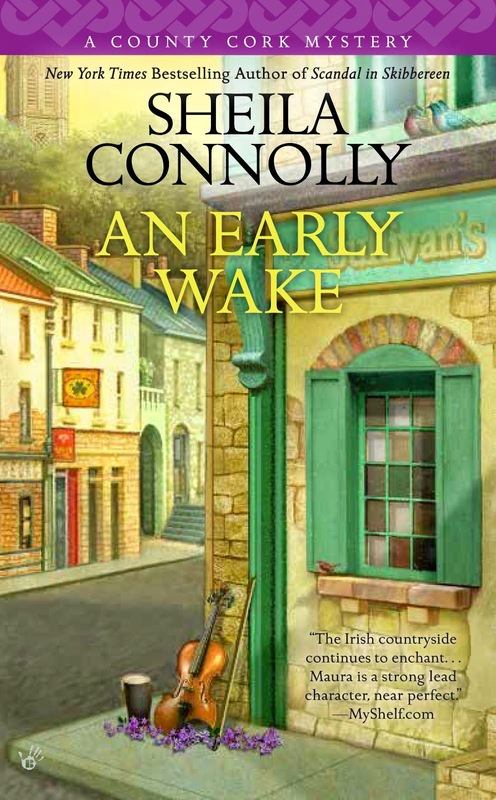 The next book in the County Cork series will be An Early Wake, coming in February 2015. I’m giving away one copy from that series: if you haven’t read them yet, you’re welcome to either the first, Buried in a Bog, or the second, Scandal in Skibbereen (both are available in print and digital format). Or if you can wait a bit, I’ll send you a copy of An Early Wake—I’ll have author copies before the official release date. And in honor of the season, I’m including an Irish bookmark! Just leave a comment below and you'll be entered in the drawing. This series sounds great and I love the bookmark. My great great grandmother came from Ireland. I've greatly enjoyed all of Sheila's books! Since I live in Western Massachusetts, I really find the Orchard series especially enjoyable, with all the familiar landmarks and towns! Another wonderful book cover. Wonderful book mark. I collect mysteries and novels with an Irish theme, so this series is going on my Amazon Wish List. Thanks so much for your generosity—I would love to win a book in this series! I've read both books in the series, so I'll love to win a copy of the third. I love this series.
! Thanks for the chance! I have not read this series yet and I can't believe I have missed it! Now I have to read this series. Old Billy seems like an interesting character. I love the series and I do love that Irish music. I have dvd's of the Celtic Women who are just simply amazing. Yes Sheila I have the patience to wait. Please enter me in the contest. An Early Wake in paperback is my choice since I have the previous two in the series. Thanks for the opportunity! dmskrug3 at hotmail dot com. Always looking for a good book!! I haven't read any of this series yet but it's definitely on my TBR list. I love your Orchard Mysteries! these sound like great books, thanks for the chance!! I have Buried in a Bog in my TBR pile. I really must get to it! Sounds like a fun story in the next book. I enjoyed the Museum series (I used to work in a theater in the basement of a museum, and often thought of what a great murder scene it would be), and I'm sure I'd love this one as well. I'd like a copy of "Buried in a Bog" if I'm the lucky winner. Thank you for offering! I love the County Cork series! I haven't read this series yet but it looks good. I will be adding it to my to be read list. I would love to "travel" to Ireland for a good mystery. Thanks for the contest. Stories set in Ireland just seem go magical and mystical and romantic. And a little mystery and murder doesn't hurt. Thanks for the giveaway. Sounds great! My Fendlay ancestors were from County Cork. I haven't read this series but it is on my wishlist! Loved the first book, so I'd like a copy of Scandal in Skibbereen. I love the series. I've read the first two. Thanks for the wonderful contest! Sounds like this is going to be an interesting read! T'would be wonderful to have the music and magic return. I haven't started this series yet, I love the orchard series so I'm sure I'll enjoy this one just a much. Thanks for the chance to win. Love this series! Can't wait until February! I would love to read this Book...Please enter me.. Thank you so much for a chance to win. Would love to have a new book to read. Happy holidays. Great series! I wasn't sure I would enjoy it, but the mystery and the humor won me over. Thanks! Thanks for the great giveaway! I love finding a new (to me) series to fall into! Thanks SO much for the Giveaway! I would love to win and start on this series with the first; Buried in a Bog! Love the sound of that title and the characters! Sounds like such a fun series!!!!!!!! I have not read any of these yet, but there is a new time for every thing. I like the whole Irish thing too. :) Thanks for the chance to win! Thank you Billy and Sheila for an introduction to this series. I have yet to read the first in the series (Buried in a Bog). This would be the one would choose if I would win. Love the blog...been following along for quite some time now and just get tickled pink to read what the characters have to say! Thank you for this chance. I haven't read this series yet but I love your Orchard Mystery series. Gosh - I didn't realize that this author had so many different series. Thanks for letting me know about a new one to me. Sounds like a great read. Glad I found out about this author. Thanks. I can't wait to see what happens next with Maura. Sorry to say I haven't tried this series, but am anxious to start. Sorry I haven't tried this series, but am anxious to start! This looks like a fun series! I just added An Early Wake to my "want to read" list on Goodreads. What a wonderful giveaway. This is a great series. I cannot wait for the third book to come out. There are some great books coming out tomorrow too! The Ghost and Mrs. Mewer is so good (and funny) as well as Paw and Order. Thank you for the chance to win. I love this series. I thought of Maura while visiting Ireland this past. June. Love this series. Happy to see a new one. Sounds like a really wonderful series! Definitely have to read this one. What a beautiful bookmark. Would love to read this series. Haven't had a chance to read these yet, but my family is from Co. Cork, or at least sailed from there, so I am intrigued. I love this Irish series and can't wait for the new one. It will be a long wait until February! Visited Ireland in September and can't wait to read the new Maura. It will fill dreary February with great memories. Wow! Wishes do come true! In planning my new year's reading agenda, it crossed my mind that it would be great to have another County Cork mystery to read around St. Patrick's day. And here it is! Since one of my ancestors came from County Cork, this series is of special interest to me. Right now, it's impossible for me to travel to my ancestral homeland, but at least I can do it vicariously through the books in this series. I already read the first two books and I'm anxiously awaiting the release of An Early Wake. Thanks, Sheila! Is this giveaway over? I hope not. Love the bookmark - what a great giveaway - hmmm... which do I covet more??? Who can resist an Irish pub story & chance to win bookmark? Not I so hope in mix for a chance. I love the variety of Cozy Mysteries by the various authors on these pages. Please keep up the great stories and Thank You for the work you have already created. I LOVE Cozy Mysteries. I am looking forward to finding more lovely books and to reading this series. This blog is introducing me to lots of new series this month! This one sounds great.